Ensuring access control is a challenge for any organization, but virtually impossible to maintain using manual processes. An automated control system with continuous control monitoring is essential today. Organizations running SAP can benefit from establishing a best in class automated solution. Join ControlPanelGRC’s Chief Technology Officer and SAP security and controls expert Scott Goolik, as he walks us through the various aspects of access control and demonstrates the differences you will find in running a manual versus automated access control system. This event is especially useful for auditors, security professionals, and compliance and risk teams in companies that run SAP. Built by SAP professionals for SAP professionals, ControlPanelGRC® is a Governance, Risk and Compliance platform for SAP environments. Through exceptional usability, rapid implementation, seamless integration to SAP, robust reporting and analytics broad functionality, and an easy-to-understand user interface, ControlPanelGRC helps makes SAP users Always Audit Ready™. 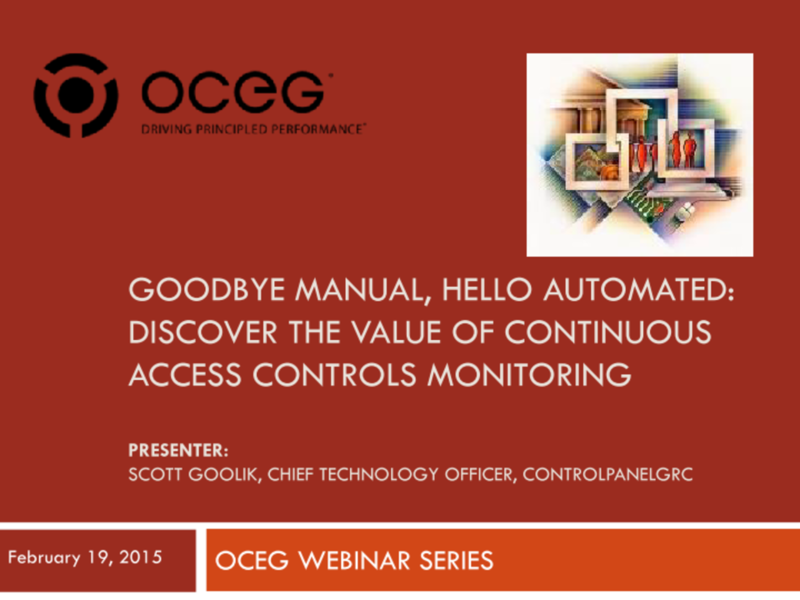 We have emailed instructions to access Goodbye Manual, Hello Automated: Discover the Value of Continuous Access Controls Monitoring Slide Deck to . Make sure the email arrives in your inbox: either add "support@oceg.org" as a safe sender to your email platform, or if you use Gmail, drag our email into your Primary tab.